First of all, Seth says thanks for all the love. Oh boy-so about a year and a half ago i started learning crochet and i did alright but it just wasn’t sticking so i set it aside. 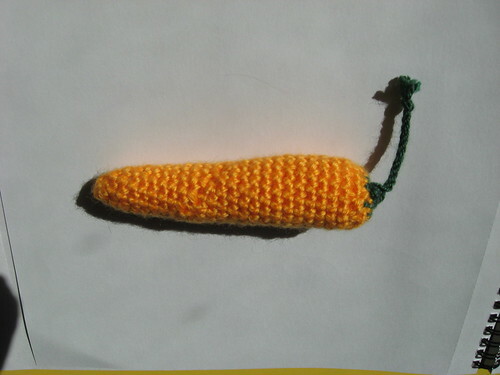 So i started out with the first project-A carrot. Carrot, originally uploaded by Craftydiddl. When we get back from our trip then i will pull it back out but i have a lot going on right now and until we leave. i have a crochet book from Debbie Stoller and i think i need to just go back and start from the beginning and relearn all the little details i need to know again. i mean i remember all the basics but something isn’t clicking so i think it will help. Do any of you crochet or have you tried it? I haven’t crocheted in years. I learned in 4th grade. I *think* you are going through 1/2 of the stitch and not the whole stitch. There must be a place online with crochet videos or crochet troubleshooting. Or what about a ravelry group? There must be one! Good luck! The book looks great.